I made some of these Shortbread Rounds for my friend Ben's birthday at work! It's a recipe that doesn't use any leavening agents, so they remain as little round cookies. The dough is also crumbly when you make it, until you squeeze them around in your hand to make the balls. Whip butter and sugar together with hand mixer. Bake for 13-15 minutes. Cookies will be light in color when baked. 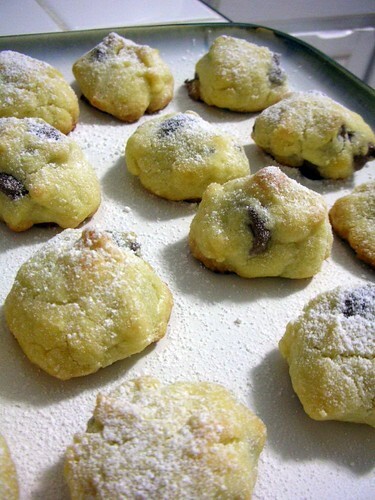 Dust with powdered sugar when they are fully cooled. My fellow blogger Tabitha brought up a great subject on how to prevent Quinoa from getting mushy, so I thought I would post some do's and dont's that I found on Tribe. If you want to have fluffy quinoa and not mushy quinoa here's how. Before anything: Rinse your Quinoa and REALLY MAKE SURE IT'S DRAINED. Most recipes say 2 cups water/broth to one cup quinoa. This is a good ratio, but if you want really, really fluffy quinoa then cut back the liquid to say 1 and 2/3 cups. A little less water. Add at least 1 teaspoon of salt to the water. Don't add the quinoa till the water is at a rolling boil. Issue #3: To cover or not to cover? It is best to not fully cover the simmering pan, leave a small but noticeable gap to let out the steam. Otherwise your precious quinoa seeds will absorb too much of the water. Don't go too easy on those little gems. A low-medium or almost medium flame is best. You should have a slow simmer going that is audible. At this heat 10-15 minutes will be your cooking time, definitely not 20 minutes. When the audible simmer begins to die down the final and most important step comes into play: Uncover the pan, turn the heat up to medium and stir your almost fluffy quinoa constantly as the last remnants of water evaporate. If you are not gonna eat the quinoa hot then immediately put the pan in the fridge, uncovered. You want to cool down the quinoa so it doesn't cook more, definitely don't leave it covered. Last Friday I went to happy hour at Brasa on 3rd Avenue in downtown Seattle, with a couple of girl friends from work. Rhonda had gone a few years ago and remembered their food was pretty fantastic, so I was looking forward to trying it out. We were not disappointed. Everything was so tasty, and for a happy hour menu, it was nice to see a really wide array of items we could choose from that included small tapas or slightly bigger fare. THANK YOU BRASA! Thank you for putting a little thought into a bar menu. I ordered the Spanish Fried Squid, Kristen had the Falafel (dinner size! ), and Rhonda decided on the Vegetable Empanadas. The lighting unfortunately was so low in the place, I couldn't get any good pictures of the food, but the presentation of each dish was really pretty and the first bites of all our dishes produced "mmmmm!" from all of us. We still couldn't really figure out what made my squid "Spanish" per say, but I'm guessing it was the different spices and sauces drizzled around it, and it was so damn good I really didn't care. Kristen's Falafel was nice and lemony, enveloped by a pita crisped on the outside. Rhonda's Empanadas' crust was so flaky and fresh, I wish I could have eaten a whole plate full. And then, we ordered even more. I know. So gluttonous. I got the Fire Roasted Vegetables, with Potato-Garlic Sauce and the girls got the Crispy Onions. And AS IF THAT WASN'T ENOUGH, we capped the evening off with some orgasmic, fresh out of the oven, Spanish Fried Doughnuts. Best Churros you'll ever have in downtown Seattle, bar none. I guess I should also mention that they had a really nice variety of drinks too. I had a glass of white Cotes-du-Rhone , but the ladies had something called the Judy Jetson, which was vanilla Stolichnaya, Tuaca, and orange juice. YUM! So check them out if you get a chance! It's a bit spendy even for happy hour, but a good "payday" place to visit. I baked this the other day for a friend who is allergic to dairy. I saw that the recipe appeared online a few times, and a few varieties of it (some with different extracts). It turned out really well! 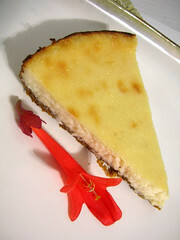 Having a texture more like a fluffy tart, it was not like a real hard "cheesecake" texture, but tasted really light with a nice tangy mild flavor. I definitely recommend it, and dare you not to have more than one slice. Oh yes, one more thing: the recipe says to mix it in the food processor for 3-5 minutes, and they're not joking! I mixed mine for about 4 minutes, and although really smooth, I think it could have been even smoother. Perhaps using the fine grain sugar would be even better. This Warm Quinoa Salad is probably one of my most favorite recipes, that I first tasted when a friend brought it over for my bridal shower. It was so easy to make, and I've already created many varieties of it, substituting some of the ingredients with whatever I have in the fridge at the time. Combine rinsed quinoa, water, onion, garlic, and a little salt in medium saucepan and turn heat to high. Bring to a boil, cover, lower the heat to low, and simmer gently for about 15 minutes. Fluff with fork and transfer to a bowl. Add chopped herbs, tomato, rinsed adzuki beans, 2 TBS lemon juice, 1 TBS olive oil, salt and pepper. Toss romaine and avocado in rest of lemon juice and 2 TBS olive oil. Season with salt and cracked black pepper. 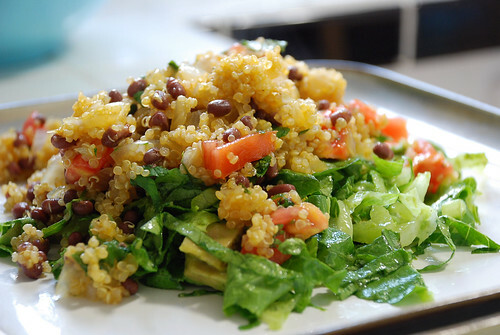 Serve quinoa on bed of salad greens. Sprinkle with chopped pumpkin seeds. Reviews only? Or should I post recipes too? I've been thinking a lot today about whether or not I should keep this blog as strictly a review blog, or also include recipes that I try out, and then review them as well. The whole concept of "Wandering Fork" was to get across that I loved to eat out and wanted to talk about it. But I definitely love cooking and baking, and think that maybe I should add some of my favorites. I just don't have the time to post frequently, or make a recipe every day like most blogs do. I'll leave that up to the professional Bloggers. Tell me what you think, and I will put up some recipes from time to time if people are interested.